When I saw that one of the Summerstown182 sailors had been killed on HMS Barham, the name of the ship rang a distant bell and I recalled a television programme about it a few years ago. It relates to the Second World War and is an almost unbelievable story involving a cover-up of the ship’s sinking and the trial and conviction of a middle-aged spritualist for ‘witchcraft’. But back in 1914-18, HMS Barham was one of 250 ships which came into contact off the coast of Denmark, just before 6pm on the last day of May, 1916. 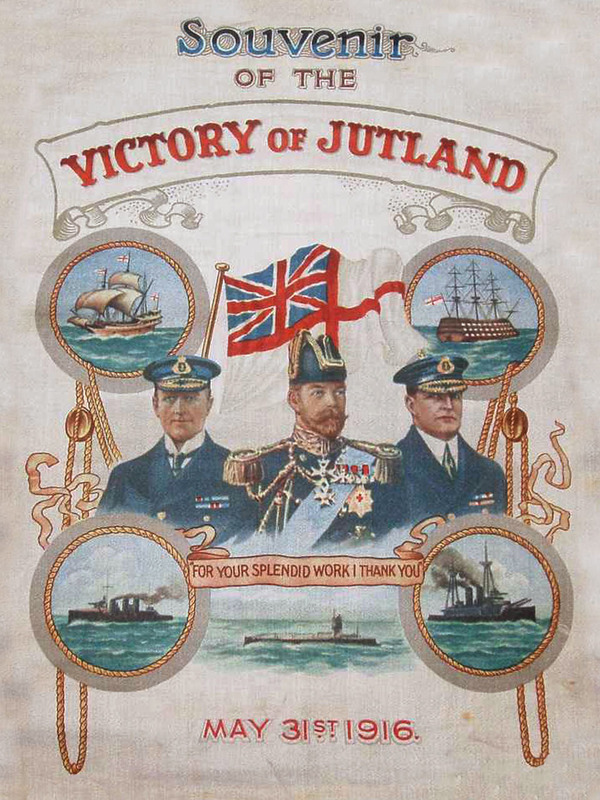 This was the Battle of Jutland, the head-to-head between the great fleets of Britain and Germany. Five of the Summerstown182 perished in this terrible sea battle; Reginald Cooper and George Rudge on HMS Invincible, Percy Newman on HMS Defence, Ernest Seagar on HMS Shark and Henry Briggs on HMS Barham. It cost 8,500 lives, 6,000 of them were British sailors, over 1,200 of whom were drowned on HMS Queen Mary. The Germans sank more ships but never really engaged the British fleet in conflict again, relying instead on the U-boat threat. Both sides claimed victory. HMS Barham survived the battle but was struck six times by ‘large calibre projectiles’ killing 4 officers and 22 men. It was at dawn and close to the end of the battle when the last of these hits caused many casualties and wrecked her wireless equipment. It is most likely in this assault that Henry Briggs, the 20 year old Sick Berth Attendant from Summerstown was mortally wounded. His body was never recovered but his name is on a memorial in Lyness Royal Naval Cemetery on the island of Hoy in the Orkneys. There are twenty three names on this memorial, five men are buried in the cemetery, the rest at sea. Eight of those lost at sea are indicated as ‘boys’, most of them aged sixteen. Unbelievably this is not quite the most northerly Summerstown182 memorial in the British Isles. That honour belongs to Arthur Preston of 5 Hazelhurst Road who is buried in Lerwick on the Shetlands. Going right to the other end of the county, Henry Briggs’ name is also on the Portsmouth Naval Memorial. Henry was the son of Frederick and Annie Briggs living at No 2, Elton’s Cottages, Garratt Green. These homes no longer exist. It was one of four cottages behind Huntspill Street, built by a Captain Elton for the workers of the ‘More Close Bleach & Dye Works’. Close to Garratt Green, a pleasant communal gathering spot, removed from the main Summerstown drag and nestling on the edge of the last remaining agricultural cluster close to Springfield and Burntwood Farms. Seventy five years before that, if the cottages had been around, they would have afforded a splendid view of the action at Robert Sadler’s Copenhagen Running Ground. Get your hands on a copy of Kevin Kelly’s excellent book about that. 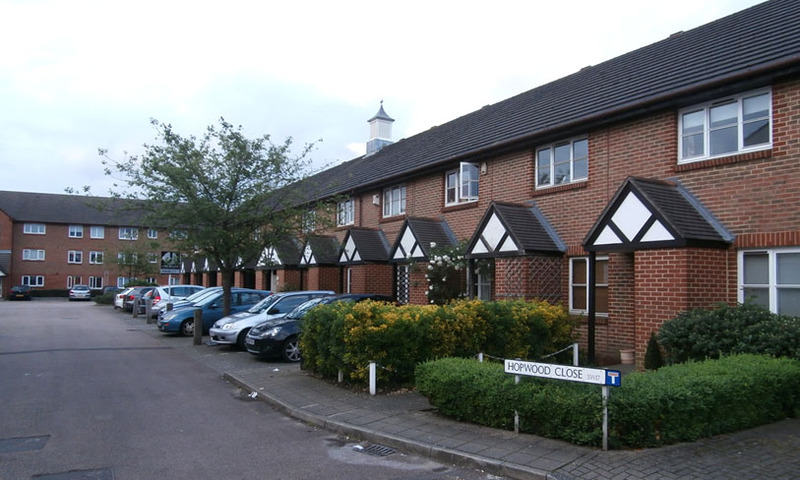 Now the location is part of a housing development dating from about 2000 called Hopwood Close. Born on 22nd August 1894 in Earlsfield, and previously working as a warehouseman, Henry joined the navy on 29th April 1914. He was five foot seven and had a scar from a burn on his right arm and one on the right side of his neck. HMS Barham may have survived Jutland and indeed the entire First World War but it wasn’t quite so fortunate in the Second World War. On 25th November 1941, off the North African coast, she was hit by three torpedoes from a U-boat. As the ship turned over and capsized she split apart in an almighty explosion which was famously captured on film. Over two thirds of her crew, 841 lives were lost. The submarine did not realise it had sunk the Barham and in an effort to conceal the sinking, the Admiralty suppressed the news of the ship’s destruction so as not to shake public morale. Relatives were notified but ordered to keep the story to themselves. Christmas cards ‘from the ship’ were even sent out and it wasn’t until 27th January 1942 that the news was made public. The film of the the explosion was never aired until after the war. A few days after the disaster, at a seance in Portsmouth, a spiritualist called Helen Duncan reportedly summoned the spirit of a sailor. HMS Barham and the fact it had sunk were mentioned. She was accused of leaking military secrets and eventually arrested in 1944 and charged with violating the 1735 Witchcraft Act. She spent nine months in Holloway prison. It is believed the authorities were fearful that the scottish-born mother of nine would reveal the date of the forthcoming D-Day landings. There is a permanent memorial and Book of Remembrance to all who lost their lives on HMS Barham in Westminster Abbey and a special service in their memory is held each November. Samuel Ambrose Tickner, the name has a joyful ring to it. Playful and voluptuous, yet steadfast. Surely a soldier with a smile on his face and a spring in his step. But in fact not a soldier, an aircraftman – if ambrosia is the food of the Gods, Samuel is up there with them, feasting in the clouds, guarded by angels. A lovely website called ‘From Surrey to the Somme’ details the exploits of the Tickner clan, most of whom hailed from the leafy Surrey village of Peaslake. Colin Tickner runs the site and although Samuel gets a mention on there, not very much is known about him. He is one of 67 Tickners who were killed in the First World War. The son of William and Ann Tickner from 7 Franche Court Road, the family lived in the house where Sunday School teacher William Mace was born. William Senior was a fishmonger by trade and his shop was literally just round the corner at 741 Garratt Lane, ‘WA Tickner & Sons’. 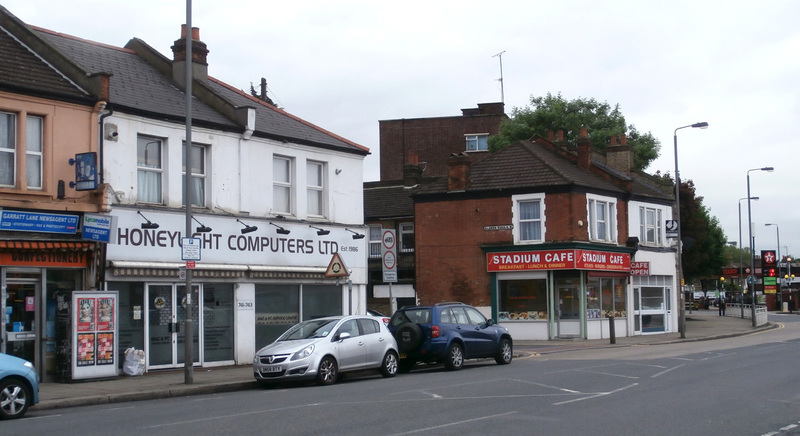 The site is now home to Honeylight Computers, on the corner of Aldren Road. Its actually the left hand section of the premises, under the word ‘honey’ naturally enough. Samuel was 14 at the time and working as a clerk but two of his older brothers Fred, a frier and Henry, a fish cleaner worked in the shop with their Dad. Samuel joined the Royal Flying Corps on 28th January 1916 as a driver with the rank of Air Mechanic Class 2. The RFC was the air arm of the British Army during the First World War, merging with the Royal Naval Air Service in 1918 to become the Royal Air Force. He transfered to the RAF with a Class 3 ranking and was further promoted to Aircraftman 1st Class. A London Gazette record of June 1919 indicates that he was also awarded a Meritorious Service Medal. In the RAF this was intended to recognise outstanding service on the ground, so Samuel was most definitely not up in the skies. Certainly at the beginning of the war, pilots all came from quite upper-class backgrounds and there weren’t many fishmonger’s sons in their ranks. The silver medal, 36mm in diameter, has the recipient’s details on the rim. The ribbon is crimson and light blue, with white stripes at both edges and down the middle. For a long time we thought that Samuel Ambrose Tickner was buried in Belgrade, capital of Serbia. Nothing to do with the Balkans though, Belgrade Cemetery is in Belgium. Tragically he survived the war by over three months and his date of death was 28th February 1919. 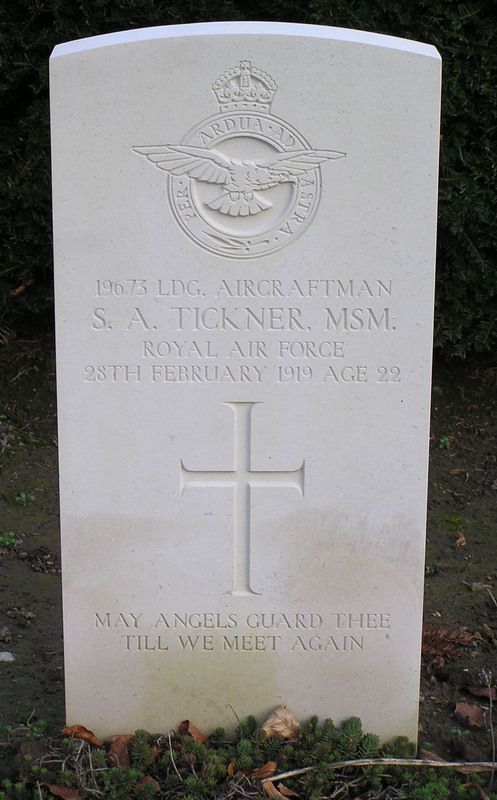 The parish magazine of April 1919 announced ‘We have heard with regret that Samuel Ambrose Tickner, RAF, died in Namur Casualty Station on Feb 28th.’ In the same paragraph Reverend Robinson mentioned the death of two other soldiers from influenza and it is possible that Samuel was also smitten by this epidemic. Its also possible that he may have been killed in some kind of accident, not uncommon as forces personnel struggled to clear up the mess of war. Belgrade Cemetery contains 249 graves. 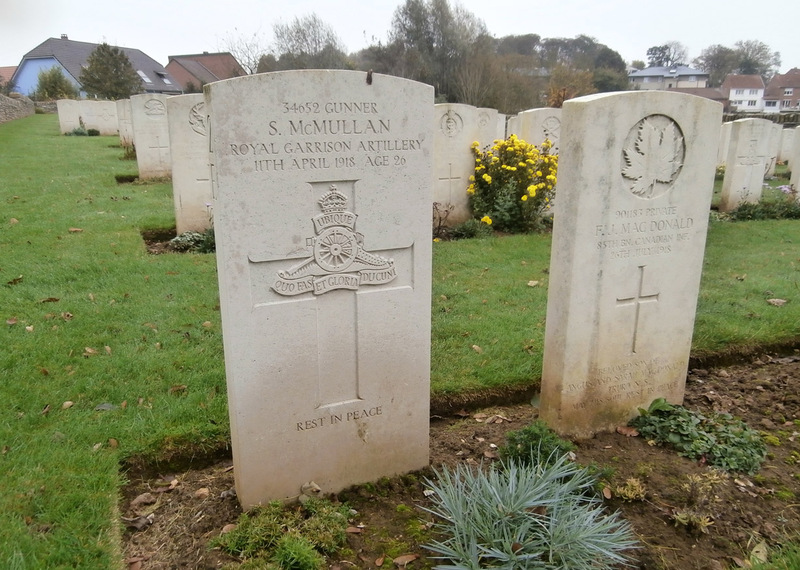 Most of the men buried in this cemetery died like Samuel in the Casualty Clearing Stations based in Namur after the Armistice. And he’s in good company, for also resting there is Mabel Gladstone, a nurse from Queen Alexandra’s Imperial Military Nursing Service, one of only two female First World War casualties who are buried in Belgium. 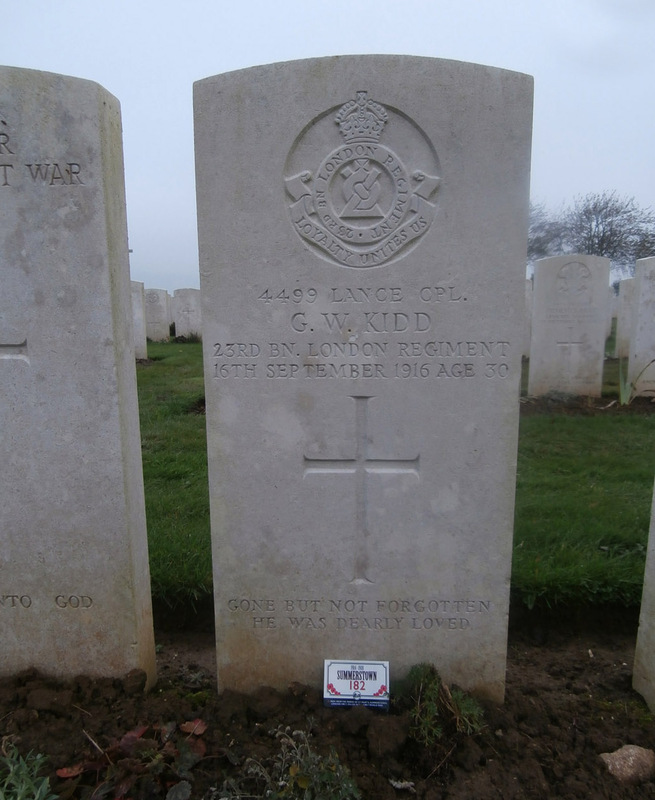 David Lam, contacted through The Great War Forum, kindly supplied the photo of Samuel’s grave which he took about five years ago. It is crystal clear and appears as if the letters have only been cut yesterday. 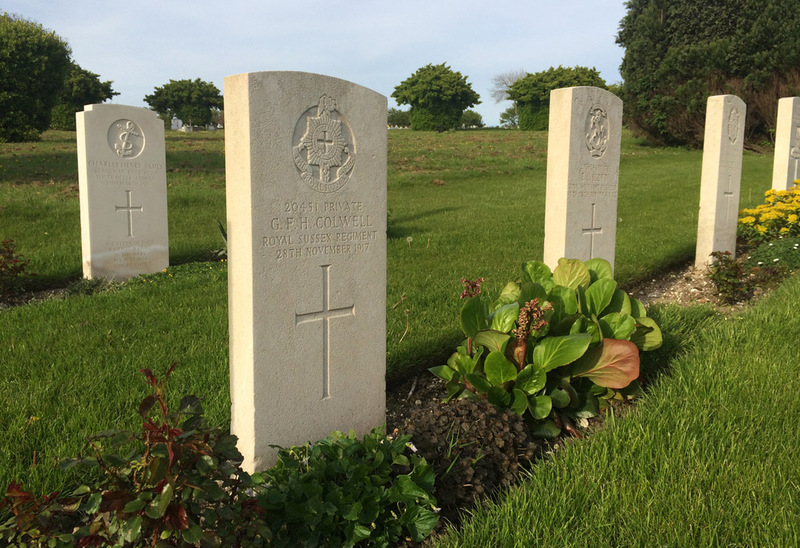 They might well have been as the Commonwealth War Graves Commission take care to replace headstones which have become too weathered or illegible. UPDATE On 28th February 2015, we happened to be doing one of our Summerstown182 Walks on the 96th anniversary of Samuel’s death. We were passing down Franche Court Road and paused outside his house to leave a poppy cross and remember him with a minute’s silence. It was a very special moment on a walk which was attended by three Summerstown182 families and has assumed legendary status. 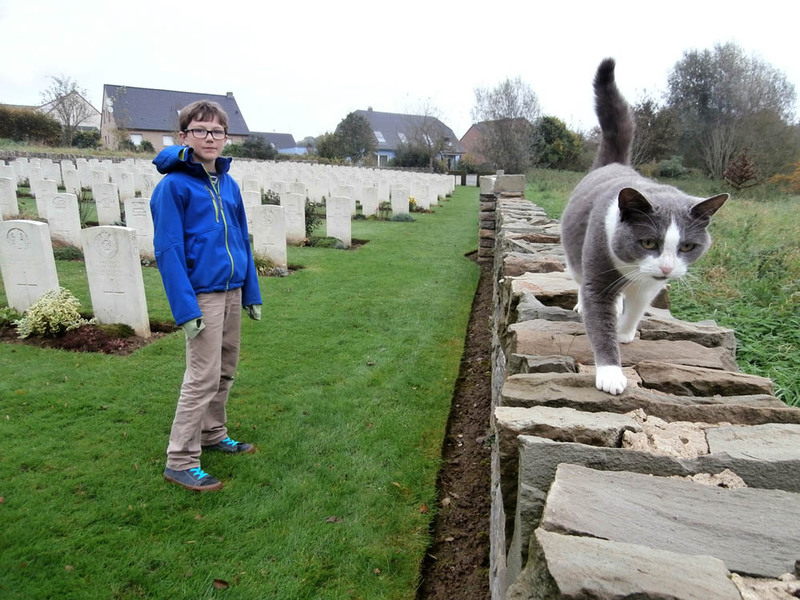 In August 2015, heading home from our summer holiday, we pulled into Namur determined to visit his grave. It was an exciting moment to be entering the capital of Wallonia, scenically straddling the confluence of the Sambre and Meuse rivers. Finding the city cemetery was not without its challenges, taking a few wrong turns up winding streets in our camper van on one of the hottest days of the summer. His headstone shimmered in the sun, as pristine and white as it appeared in David’s photo. I feel we haven’t heard the last of the fishmonger’s son from Franche Court Road – ‘May Angels guard thee till we meet again’. Writing this on 25th May, I had something on my mind all day. When I first started researching the Sunday School teachers and their military histories, this date was highly significant. They were, like 19 other members of the Summerstown182, all in the 23rd (County of London) Battalion of The London Regiment, a territorial unit with their HQ at 27 St Johns Hill, Clapham Junction. Their first big battle was known as Festubert, a very bad day for southwest London. The regimental war diary describes how on 25th May at Givenchy ‘Orders given to attack German trench. Casualties 499, including three officers killed and ten wounded’. This attack occured at 630pm and the fighting lasted all night as the Germans fought fiercely to recapture the lost trench. Particular mention is made of ‘the stretcher bearers who all through the night worked, often under heavy fire to evacuate the wounded’. 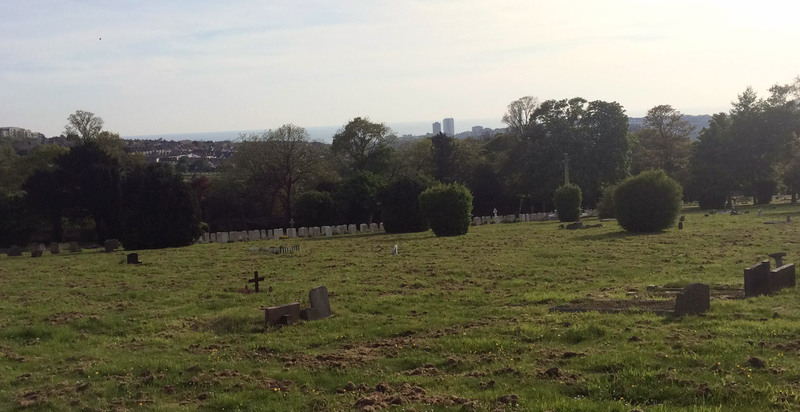 On the 26th May the Battalion were relieved from the captured trench and on 27th it is noted that ‘Names of 123 men received from Division as being buried’. William Mace from Huntspill Street and George Boast from Aboyne Road were among them. In the local South Western Star newspaper of 18th June 1915, there appeared a full list of 178 names of men from 23rd London Regiment killed in the fighting of 25th-26th May. The names fill a whole column and reading them must have been a great jolt to local people. At a subsequent memorial service in Battersea, the vicar compared the losses of the 23rd Regiment to the loss of The Titanic a few years before. 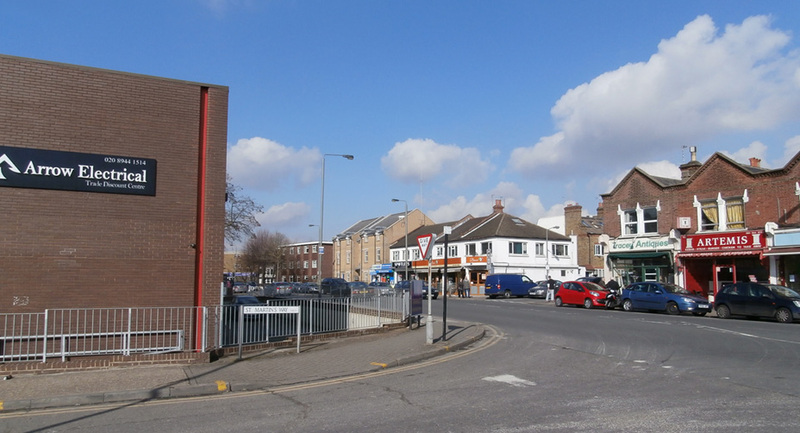 Its doubtful if news if this carnage would have filtered home so quickly, but for whatever reason on 28th May 1915, just a few days after the catastrophe, a 29 year old from Tooting called George William Kidd joined the 23rd at Clapham Junction. The information about George Kidd has come from Marion Kidd who contacted us some months ago. Her grandparents were married in St Mary’s church and she wondered if any of her father’s six cousins killed in the First World War were on the memorial. Two of them were, George Kidd and his half brother, John James. Marion suspects George’s parents met through a mutual older relative with the wonderful name of Annabella Lovely. Born in Wimbledon, the son of George John Kidd, a copper roller, his mother Alice died soon after his birth. George senior married again and had twelve more children including John James Kidd, another of the Summerstown182, killed on the Somme less than two months before his half brother. George lived with his Grandmother until his marriage in 1906. He was now a bricklayer and its just possible he was involved in building the new St Mary’s Church. Exotic names seem to follow him, because on 19th June 1906 and now living at Noyna Road, at Holy Trinity Church, he wed the fantastically named Zingara Lilian Florence Setterfield from Huron Road, just the other side of Balham High Road. To even up the first name score, George had cheekily given himself the additional first name Ray on his marriage certificate. His father followed suit and also gave himself an extra moniker. George and Zingara lived at 59 Rostella Road, the pale blue house pictured above and their son Sydney Thomas Kidd was born on 16th November 1911. When George joined up they had moved to 83 Mandrake Road, Tooting Bec. 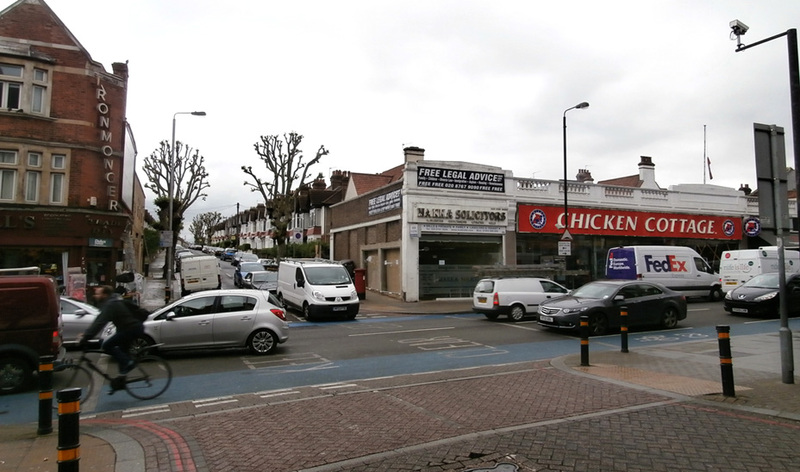 What does it say about modern society that so many Summerstown182 homes are now in close proximity to fried chicken shops? Its up the hill on the left hand side, directly behind Fircroft Primary School. After George’s death Zingara remarried a Mr Chapman and was living at 112 Mitcham Road, which was where the Commonwealth War Graves Commission wrote to her. George was killed on 16th September 1916 at the Battle of Flers-Courcelette, yet another fancy name, but forever famous for the battlefield debut of a new invention called the tank. The 23rd Battalion were part of what was known as the 47th Division who took part in a major offensive attempting to puncture the German line and end the stalemate on the Somme through the introduction of tanks. But they weren’t really ready or fit-for-service, there were 49 of them, but only 15 worked. Cumbersome and unreliable, these rolled slowly forward at a speed of half a mile an hour on the morning of 15th September when the assault began. Churchill complained ‘My poor land battleships have been let off prematurely on a petty scale’. Two kilometres were gained in the first three days of the attack including the much-prized village of High Wood but at a huge cost of life. As well as George Kidd, Raymond Asquith, the son of the British Prime Minister, Herbert Asquith was killed in this battle which was called off after a week. 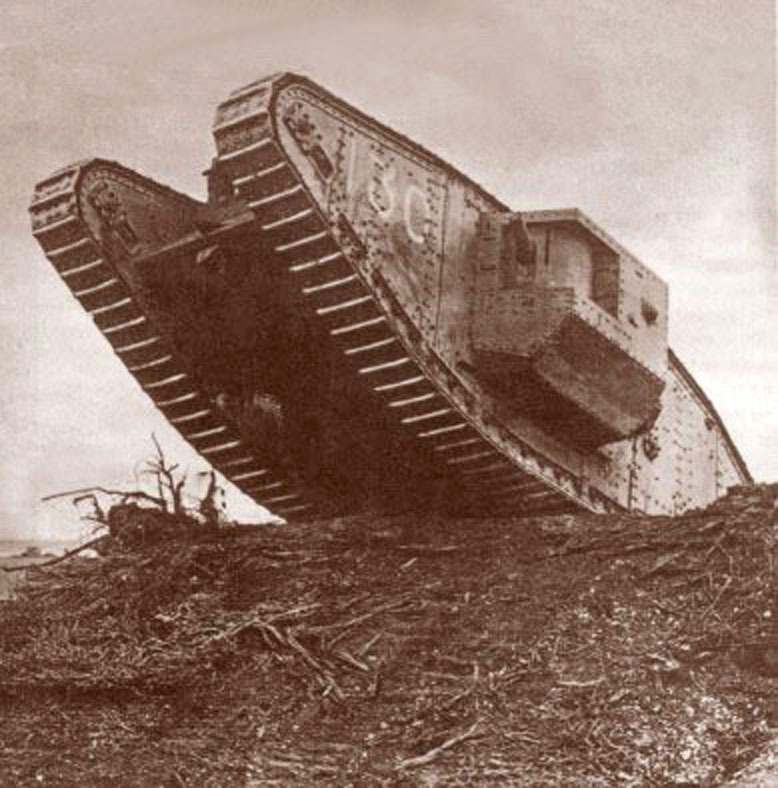 Haig though was well pleased with the tank and ordered a thousand more which were used at Cambrai in November. 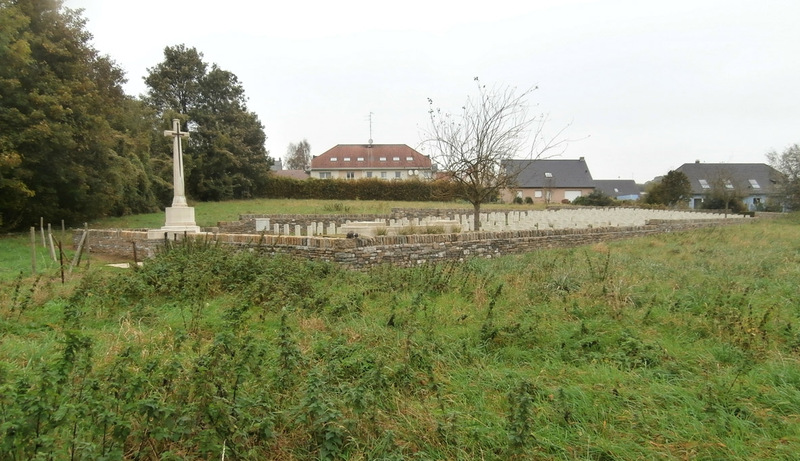 As for George Kidd, the man who has moved around the poppy map more regularly than any of the Summerstown182, typically he ended up in a cemetery with a lovely name, Caterpillar Valley, near the village of Longueval. UPDATE: In November 2017 Steve Head got in touch to tell me about his great uncle, Rifleman Frederick George Jones who also once lived in Rostella Road at No3. He died on 17th September 1916, the day after George Kidd. Please click here to read Fred’s story. Its a long way to Tipperary from Summerstown, so what on earth was the story behind an elegantly lettered stone plaque on a house at the end of Franche Court Road and its apparent homage to the southern Irish town, famed for its cider orchards? This has been intruiging me for some time. The first house on the right as you enter the street from Garratt Lane, it stands like a sentry, watchful vigilant and protective. The front garden is currently a delightful tangle of multi-coloured roses all vying for attention. It doesn’t appear to have a number and local residents say that they have always just known it as ‘Clonmel’. Another one of the Summerstown182, William John McMullan lived at 30 Keble Street with his father who had the same name. One of these two, or possibly another William McMullan lived for some time at the house with the Clonmel tablet. But that didn’t really help – the Keble Street McMullans were from Co Down, an equally long way from Tipperary. I suspected that Samuel Sidney McMullan was related to William but I coudn’t quite work out how. A very small clue on the Forces War Records database provided an inkling – this stated that Samuel’s town of residence was Clonmel, Co Tipperary. Things were warming up. The connection was finally confirmed when Marion of the Streatham Society pulled the rabbit out of the bag. Samuel’s 1916 marriage certificate. On the 29th of November 1916, Samuel married Mabel Miriam Cole at a Registry Office in Ipswich. He was 25 and gave his occupation as a gunner in the Royal Garrison Artillery, though he also indicated that he worked as a ‘laundry vanman’. He gave his residence as ‘Clonmel’ Franche Court Road. Mabel’s mother Alma was one of the witnesses. The following summer Mabel gave birth to a daughter called Joyce. William Senior was a ‘Laundry Horsekeeper’ and with the enormous Anglo-American Laundry at the end of the road and three others close by, neither McMullan would have had much of a commute. As for Clonmel, it would seem that Samuel was there at some stage and obviously held it in great affection. 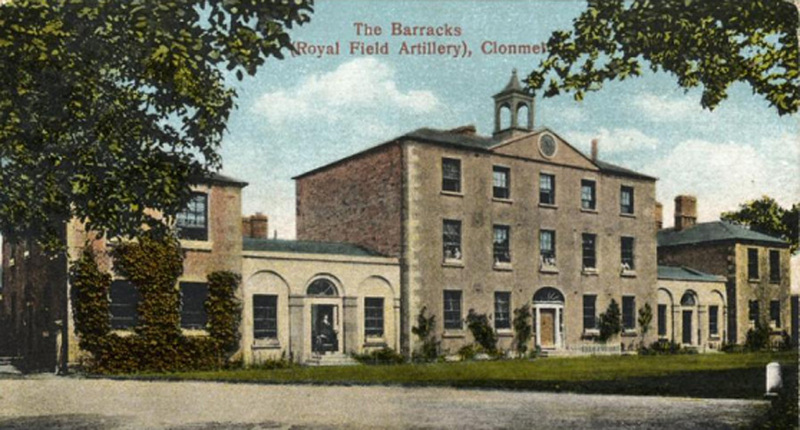 The fact it is in his service record details suggests a military connection and Clonmel was in fact home to Kickham Barracks, a British Army garrison in Ireland from the time of Cromwell. It was the main training base for soldiers from that corner of Ireland prior to the First World War. Samuel was born in Belfast in 1891 and its just possible that in the midst of the Home Rule crisis with arms flooding into the country and unionists and nationalists preparing for civil war, that an adventurous lad from the north might end up in the army and be stationed there. In any case the war put that particular conflict to one side. William John McMullan was two years younger than Samuel and in the 1911 census record was working as a gardener and living with his father and step family at 30 Keble Street, literally the house directly opposite where I’m sitting. Both father and son were born in Emdale, Co Down, the birthplace of Patrick Bronte. William joined the Middlesex Regiment and was killed at the Somme on 17th September 1916. Samuel was with the Royal Garrison Artillery’s ‘K’ Anti-Aircraft Battery with whom he would have been operating some of the most powerful and destructive guns and howitzers in the British Army’s arsenal. His death near Arras on 11th April 1918 indicates that he was yet another of the Summerstown182 who was swept up in the German Spring Offensive. Just one of 178,000 British and Commonwealth soldiers who were either killed, wounded or went missing in this battle where the German army advanced 40 miles and almost changed the course of the war. With a nine month old child to look after, Mabel returned to Ipswich. Samuel’s Commonwealth War Graves Commission record notes that he was ‘the husband of Mabel Miriam Cole of 72 Rendlesham Road, Ipswich’. For whatever reason, she reverted to her maiden name and the McMullan connection was gone. Their daughter, Joyce Cole married Kenneth Robinson in Ipswich in 1939. If they had any children there is a good chance they would still be alive and might like to know about their Grandfather and his Summerstown-Clonmel connections. Funnily enough there is also an apple connection between the two places. Behind Franche Court Road was an immense orchard and an elderly resident I spoke to recalls munching his way through a stash of them in the Anderson shelter at the bottom of his garden. I invite any grandchildren or other relatives to join us on a walk and hear about this and other stories, and while we’re at it, lets raise a glass of Bulmers to Samuel and William McMullan of the Summerstown182. UPDATE: A fantastic postscript to this was that in August 2015 I received an email out of the blue from the great grand daughter of Mabel Cole. She told me that her (great) Auntie Joyce had only passed away a couple of years previously and had been trying to do some research into the father who she never knew just before she died. I was very soon in touch with Joyce’s niece Valerie who sent me the above photograph; Samuel, baby Joyce and Mabel. There are three very similar poses and they were given to her by her Aunt to keep Samuel’s memory alive. For many years the photos remained hidden away as Mabel’s second husband preferred not to have any reminders of her earlier marriage. Valerie recalled that Joyce ‘always had Samuel’s lovely eyes – she was my favourite Auntie’. The story of how we made contact with the granddaughter of Louis Marie Joseph Vital Danzanvilliers is really quite remarkable. When I suggested one sunny Sunday morning in February, that my friend in Belgium, Bart Seynaeve, take photos of some of the Summerstown182 graves, in my wildest dreams I could not have imagined what it would lead to. Let alone that he would hop on his bike that very day and get some pictures back to me that evening. But then Bart and I have collaborated on First World War projects where crazy and wonderful things have happened, so perhaps I should have expected it. 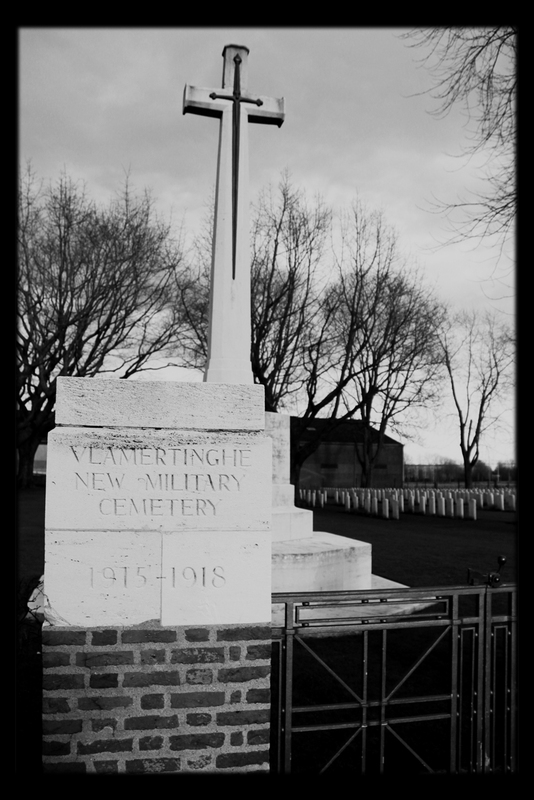 As explained in a previous post ‘The Frenchman’, one of the cemeteries Bart went to was at Vlamertinghe, a small hamlet west of Ypres. There he found and photographed not just Louis Danzanvilliers’ grave but a wreath placed beneath it. ‘To Grandad, All my love, Marie’. Bart not only gave me this priceless photographic clue but not long before, he put me in touch with Dorothy Williams. It was corresponding with this genealogist from Preston, whose interest in where the Sunday School Teachers lived, that gave me the idea to indicate their homes on a map. The note on the wreath also mentioned Marie’s husband’s name and from that small scrap of information, Dorothy was able to provide me with an address in Tamworth, Staffordshire where Marie might possibly live. We knew Louis had a son who would have been seven when Louis died, Marie was surely his daughter. The first address I wrote to didn’t provoke a response but then Dorothy came up with another and I tried again. A few days later the phone rang and I was talking to Rosemarie Matthews in Tamworth. Some weeks ago she sent this beautiful photo of who she believes is her Grandad in what she described as his ‘Number Ones’. He may not be the grand french aristocrat I had first imagined he would be when I read his name, but he certainly looks the part. Rosemarie, named after one of Louis’ middle names, was understandably a bit bemused at how she’d been tracked down, but she was thrilled to hear about the interest in her Grandad. She feels a strong connection with him and visits the grave in Belgium regularly. It had been the latest visit in November when she placed the wreath that Bart spotted. For many years she had made these journies with her husband Colin but he unfortunately passed away last June and this was her first solo visit. Rosemarie was brought up in Summerstown and although she has lived in the midlands for about 50 years, she still feels a bond with this area and last visited about ten years ago when she went to the church and had a look at the war memorial. She’ll be back soon hopefully to do a guided walk. Louis was born in Paris but came to London aged three with his parents and brother Arthur. He worked in a hotel in central London. Rosemarie thinks he was quite small, five foot two, and perhaps only eligible for the army through the ‘bantam’ selection process. He was though bigger than his wife Caroline who was four foot tall and developed serious back problems through hard work and constant bending in the laundry. 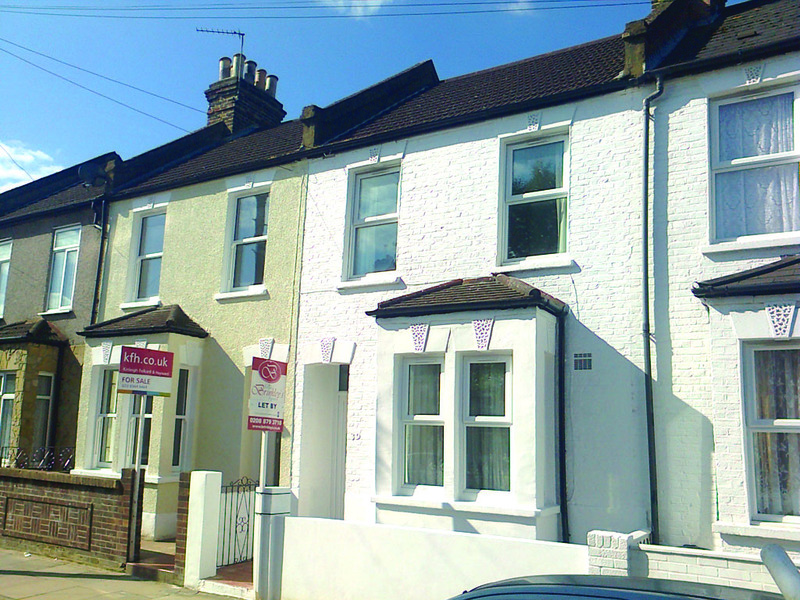 In 1911 they were living in a two-roomed property at 636 Garratt Lane near to the corner with Maskell Road. The site of where the house was is now occupied by a lighting showroom on the edge of the Riverside Industrial Estate, roughly opposite Artemis kebab shop. Louis joined the 12th Battalion of The Suffolk Regiment. This was what was nown as a ‘bantam battalion’ (consisting of men between 5 foot and 5 foot 2 inches). Enlistment began in the summer of 1915 after a shortage of manpower resulted in the war office dropping the minimum height of men who were allowed to join the army to 5 foot. The result of course was that many of the bantams were under the regulation age and parents kept reclaiming them. Louis was at the other range of the age scale and was killed near Ypres on 13th July 1917, aged 39. Rosemarie thinks he may be the oldest soldier in the cemetery. Her father, Louis Edward Danzanvilliers was only seven when his Dad died and visited the grave in Belgium in his fifties for the first time. He had tried to find Louis’ army service records but was told they were destroyed in the blitz. Caroline received the blood-stained ‘webbing’ Louis was wearing when he was killed but it upset her too much, so it was thrown out. Neither Caroline or Louis Edward talked very much about the death. In 1937 Louis Edward married a Vera Doris Kerslake. Come the Second World War, Vera left London due to the bombing raids and consequently Rosemarie was born in Haselmere in Surrey in 1943. It was a sensible move because 636 was indeed seriously damaged in one raid. After the war, the family moved back to 82 Summerstown, at the southen end of the road near the White Lion pub and curiously thirty years earlier the home of another member of the Summerstown182, William Francis Brown. Rosemarie attended Smallwood School and her younger brother David was born in 1949. Louis Edward, a toolmaker by trade worked for an engineering company on Summerstown called Elm Works. Rosemarie lived here until she was twenty when in the early sixties she left to join the army and met Colin. She has been in the midlands for about fifty years now but still feels a strong bond with this area and last visited about ten years ago when she went to the church and had a look at the war memorial. Apart from David and his family, the only other Danzanvilliers she knows of live in Brittany. So, Louis Danzanvilliers, short of inches, long of letters – we are so pleased to know a little of your story and are extremely grateful to Rosemarie Matthews for sharing it with us. Until the area was substantially redeveloped in the late sixties, Hazelhurst Road and Foss Road swept southwards from St Mary’s Church, separating in a great V which forked down to Smallwood Road. An extraordinary story connects these two streets with two world wars. It was told to me by Maureen Giles, the granddaughter of William Pitts whose family lived at 28 Hazelhurst Road. Born in Brighton, William married Minnie Matilda Figg in 1909. They were still there in 1911, now with two small children, Elsie and Minnie. According to the census, Willam was aged 22 and worked as a washer in a laundry. Sometime after that a third child Alfred Albert was born. When the war broke out William joined the 6th Battalion of the East Kent Regiment, known as The Buffs. This was after the colour of their uniform in a previous era. William was killed on 3rd May 1917. It is curious that there is a seven year discrepancy between his age on the census and that on his military records, which suggest he was 35 when he died. On that day his battalion were in front line trenches near Monchy in France and attacked in complete darkness. Communication was impossible and about 250 men of The Buffs were killed on what was later known as the Third Battle of the Scarpe. The official historical record of the regiment recalls ‘Zero hour was fixed at 3.45 a.m. The battalion was, during the preceding night in shell holes. Punctually on time the guns fired and our men went off into the darkness, too many of them never to see the sun rise again’. He is one of ten of the Summerstown182 whose name is on the Arras Memorial. Minnie Matilda was left with five young children to raise on her own. Alfred Albert, Maureen’s father, was only three years old when his dad was killed. For whatever reason she didn’t stay in Brighton but moved to 28 Hazelhurst Road and married again, to Robert Ware. They had a further three children, one of whom was called Eileen, born in 1932. Another sister called Minnie remembered how her Mum kept the memory of her first husband alive. A little cloth bag was placed on a peg behind the door in the outside toilet. It contained something very special and precious, wrapped up in cotton wool. The children were instructed never to touch it or look inside. The bag contained the medals of William Pitts. Without warning, on 19th November 1944, a V2 rocket fell out of the Sunday morning sky killing 34 people and turning a large section of Hazelhurst Road to rubble. A post-war map of this area showing a huge gap where the bombed houses once were, illustrates that No28 was directly in the line of fire. Minnie Matilda and twelve year old Eileen were both killed and the bag containing William Pitts’ medals was lost forever. Maureen’s mother Louisa lived at 26 Foss Road. She married Alf Pitts, literally the boy next door. By 1944 they were living at No22 with one year old Maureen. Although nine houses on this street were destroyed in the blast, their home was relatively unscathed. Maureen’s father rushing back from work that morning had been told that his wife and baby had been killed. He found out later it was his mother and sister. The area where the houses had stood remained a pile of rubble for years afterwards, a constant reminder of an incident which numbed people in the neighbourhood for a very long time. Maureen remembers vividly clambering over this bomb-site on her way to Smallwood School. Sadly photos and other mementoes of William were lost in the rocket attack. 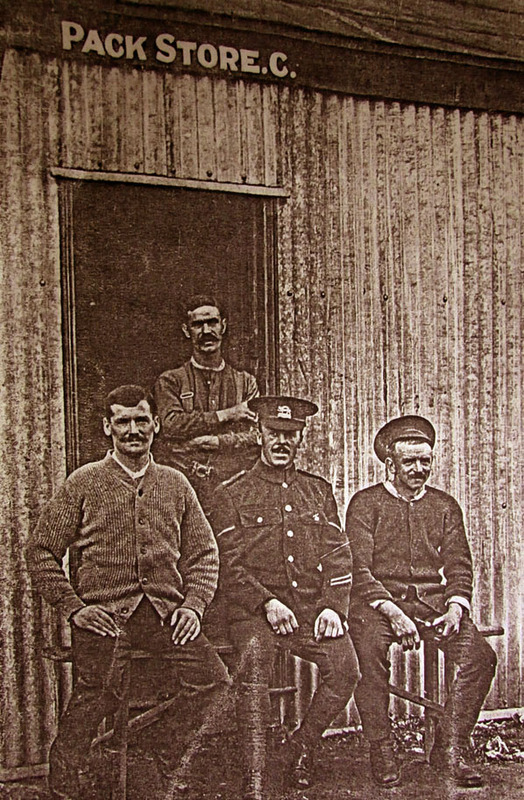 Alf ended up with one photograph of four soldiers standing outside a tin hut, one wears a cap which my friends on the Great War Forum reliably inform me, is the badge of the Leicestershire Regiment. They all look tired and as if they’ve seen too many terrible things. Its just possible one of them may be William Pitts. There was also a photo of a butchers shop in Wandsworth called Skinners but she has no idea of the significance. 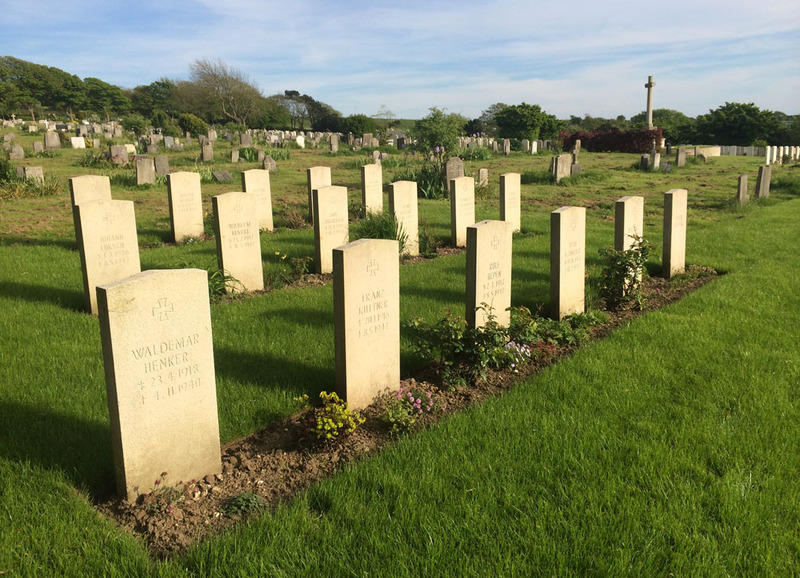 About twenty years ago Maureen contacted the Commonwealth War Graves Commission about the loss of the medals and a replacement set were issued. 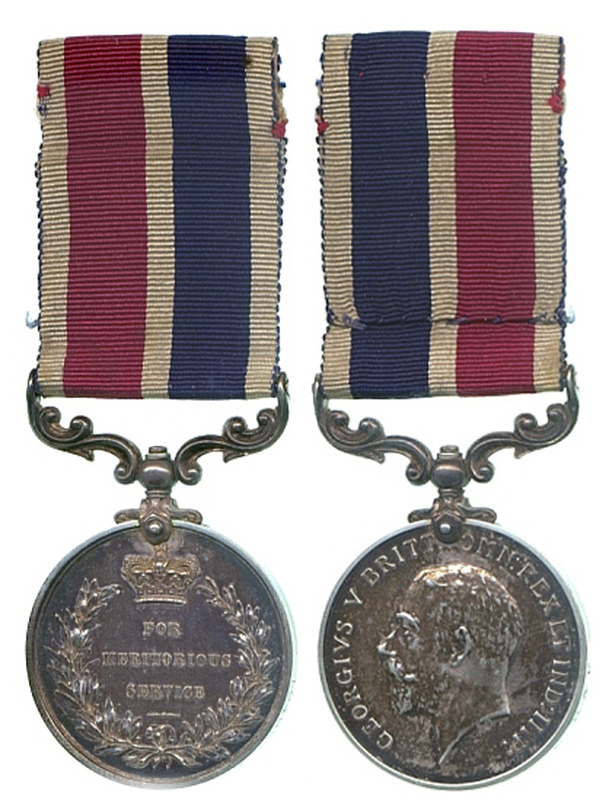 The rainbow style Victory Medal and the British War Medal. These were given to her father, a very special eightieth birthday gift for Alf Pitts, the three year old boy who so tragically lost his Dad in 1917 and his Mum in 1944. I’m not sure if Maureen keeps them in the toilet any more but they are in a nice wooden frame and no need for the cotton wool. 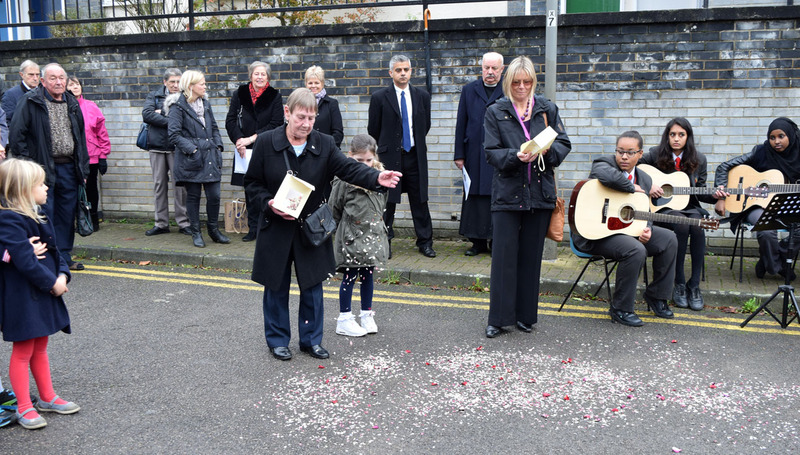 UPDATE: The photo at the top of the page shows Maureen scattering petals in memory of her Grandmother and the 35 victims of the 19th November 1944 V2 attack at a special seventieth anniversary remembrance. The car-park behind Sutton Courteney House on the Hazelhurst estate is the site of the main bomb crater. 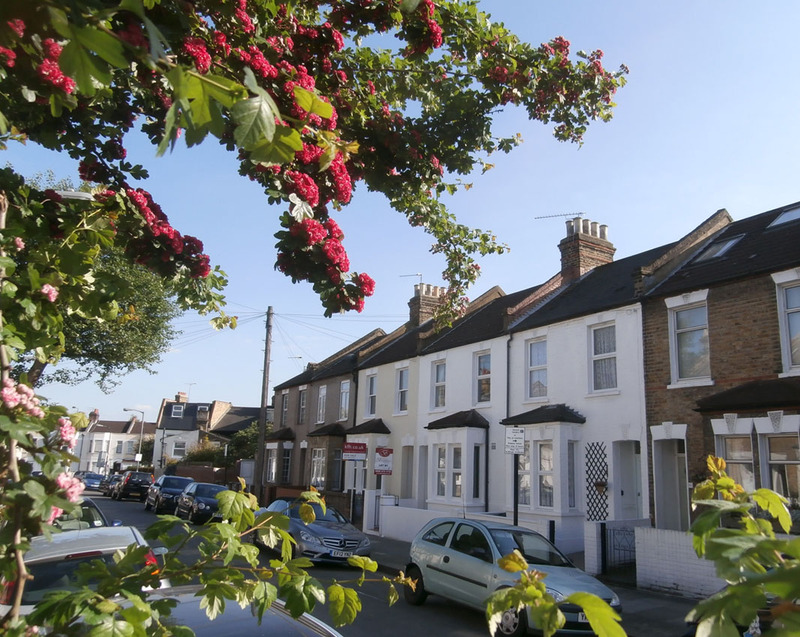 This prompted Wandsworth Council to place a green heritage plaque at the location and the ceremony to unveil that on 6th June 2015 attracted several hundred local residents. We estimated that at least a dozen elderly people who lived in Foss Road or Hazelhurst Road at the time of the incident also attended, including relatives of many of the victims and some who were literally pulled from the rubble. 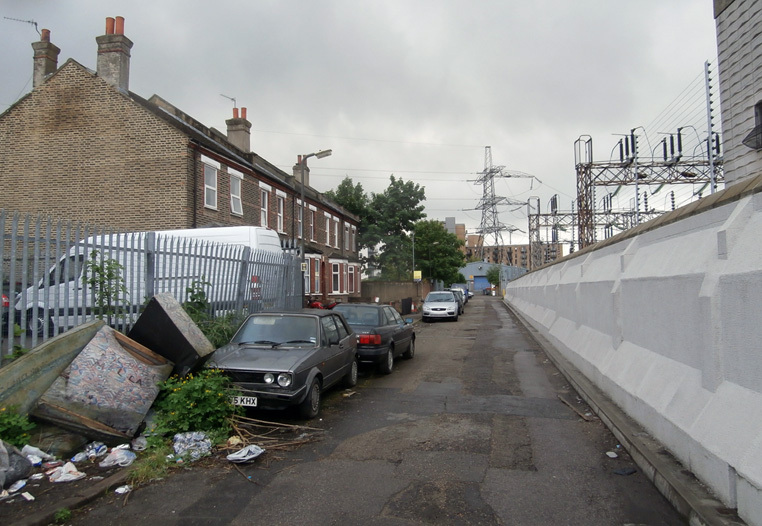 Coppermill Lane was once the main thoroughfare from Summerstown into Wimbledon. What a pleasant stroll it was, go past the watercress beds, then cross the Wandle at a bridge, though be warned, traffic entering Wimbledon had to pay a toll for the privilege. You would pay to avoid it now. Buried between the two stadiums (only one still standing), where Vinnie Jones and Mick the Miller once set the pulses racing, the area is a shambolic clutter of used car dealerships, a horrific throbbing electricity sub-station, abandoned vehicles and neglect of the highest order. Making the journey here every day about a hundred years ago from his home at 33 Summerstown was Thomas Willliam Carrigan. He was one of nine children of William Carrigan, a Dublin-born ‘leather-grounder’. In 1911 his 18 year old son had the same trade which he plied at Mr Chuter’s Chamois Leather Works in Coppermill Lane. The cluster of terraced houses that still stand incongrously in the midst of all this industrial overspill were built by Mr Chuter. But just a few years later came the war and less than a week after its outbreak on 10th August 1914 Thomas Carrigan joined the 5th Battalion of the East Surrey Regiment. His service records show that he was now living at 11 Wimbledon Road. The original houses in this strip opposite the church were demolished in the late sixties and the address is currently home to a fried chicken outlet. Thomas saw six months service in India before joining the Mediterranean Expeditionary Force in May 1915. A very big indication of the fate that befell him appears in the April 1918 edition of the St Mary’s parish magazine. Reverend John Robinson states plainly ‘We regret to hear that Thomas William Carrigan of the East Surrey Regiment, attached to the 2nd Norfolk, who was taken prisoner at Kut, has died in hospital at Ismdt’. This was on 3rd January 1917. He must have been referring to Izmit which is about 70 miles east of Istanbul. Thomas is buried in Haidar Pasha cemetery, just outside the city where there is a small white tablet memorial with his name on it. The tiny snippet of information in the church magazine allows us to build a very big picture of what happened to him. The ‘Siege of Kut’ was a tragedy that soon became largely forgotten in the wake of much greater carnage closer to home, but it is still noted as one of the most humiliating defeats in the history of the British army. Kut-al-Amara is in modern-day Iraq. 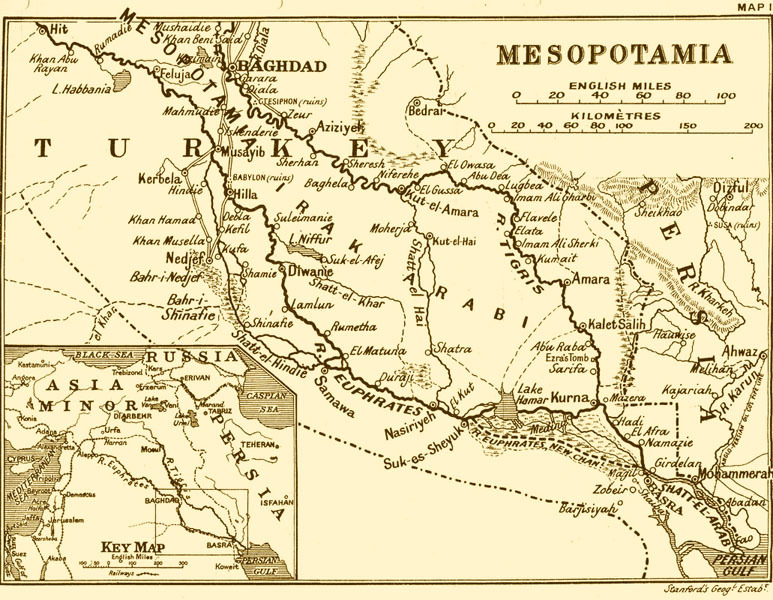 The area was then known as Mesopotamia and echoing more recent times, the key was defending oil interests, on this occasion against the Turkish empire. Establishing a strong presence in the region was also seen as vital in the aftermath of the Gallipoli debacle. A force under General Charles Townshend had been victorious at Basra and thought they could now push on and capture Baghdad. But things didn’t go to plan and they became isolated and trapped in the city of Kut on a great bend in the River Tigris. The siege began on 7th December 1915 and lasted 147 days. There were about 3,000 British soldiers now trapped in the city but the vast majority of Townshend’s garrison were Indian. They held out through a freezing winter in appalling conditions but over the next five months food supplies dwindled and disease was rife. Supplies were dropped by aeroplane, amazingly including millstones so the vegetarian Indian soldiers could grind flour and make chapatis. Three separate relief attempts were mounted which it is estimated cost 23,000 lives, such was the damage to British prestige and the determination to seek redress. At one stage the Turks were offered £2million in gold to guarantee the safe passage of the besieged garrison. This was refused. Having finally run out of food and supplies and wracked with disease, the city surrendered on 29th April 1916. Things worked out fine for General Townshend and the officer class but for Thomas Carrigan and 9,000 other captured soldiers, already malnourished and disease-ridden, the torment was only just beginning. A war poet called Geoffrey Elton who was a junior officer at Kut saw the rank-and-file being herded away ‘None of them fit to march five miles… full of dysentery, beri-beri, scurvy, malaria and enteritis; they had no doctors, no medical stores and no transport; the hot weather, just beginning, would have meant much sickness and many deaths, even among troops who were fit, well-cared for and well supplied.’ What followed next was a nine hundred mile forced route-march on foot, back across the Syrian desert to Istanbul, beginning with a humiliating parade through Baghdad. There are many stories of torture, ill-treatment and brutality along the way and shockingly a third of the prisoners never saw their homes again. Of the 2,500 British soldiers who started the march, only 837 survived it and the following years in captivity. We know Thomas died in Izmit so he very nearly made it all the way. What we can never imagine is what he suffered on that march or during the 147 days preceding it. A local Earlsfield man who has lived in Turkey has been so moved by some of the stories about the Summerstown182 and particularly Thomas Carrigan, that on a trip there at the end of the month, he intends to visit his grave and place some flowers. It would be fitting to find out a little more about this soldier and make contact with some relatives or family so they know about this interest. We think there may be family called Plumridge still living in south west London, descended from Thomas’ sister Alice. If anyone knows of them, we would be grateful if they were made aware of this tribute to their ancestor, one of the Summerstown182, who died so far away from home. I really do love Huntspill Street. A tranquil retreat from the mania of Garratt Lane. Perhaps its something to do with the bend in the road, helping to block out the noise, but its got a stillness and serenity that must make it a lovely peaceful place to live. And it is the site of a key location in the Summerstown182 world. No39 was home to William Mace, one of the Sunday School teachers whose story is told in the Sunday School Three section. After the war, his sister Marion and her husband Frederick Milton started living there. Both also Sunday school teachers, Frederick had been wounded in the war, but unlike William, had made it back. The Miltons lived here until 1930 and were in charge of organising flowers for the war memorial. Frederick Milton was also involved in collecting funds to pay for the memorial and throughout 1919, many a donation would have been despatched to this address. I passed down it today on a glorious Spring morning, the month that William was killed at the Battle of Festubert, 99 years ago. A few weeks ago the house was a delicate beige but now its been given a sparkling coat of whitewash in preparation for the next tenants. And it really has got the works – door, window frames, wall at the front. Almost like a little wedding cake and good enough to eat. The sight of this dazzling whiteness against the bluest of skies, transported me to the island of Mykonos. The Mediterranean theme is further enhanced when you enter the road from Garratt Lane and are greeted by a huge flourishing spray of the most delicately-scented lilac ceanothus. Opposite No39, one of the trees has burst into a radiant magenta flower that a neighbour advised me was a May hawthorn. All in all, on a day like this, Summerstown feels not too far removed from a Greek island paradise. Appropriately enough for someone with nautical inclinations, Francis Albert Halliday was born in Greenwich in 1871. His naval career took him all around the country before he alighted in Summerstown. He met his wife, Eveline in Pembrokeshire and his two children were born there. By 1901 the family were in Sheerness in Kent. By the time of the 1911 census he was listed as a ‘Naval pensioner/Schoolkeeper’ living at the Lee School, Swan Street, in the city of London. Sometime over the next few years they ended up at ‘The Lodge’, Smallwood Road. Like so many other retired seamen, Francis Halliday responded to the need for old sea-dogs to take charge of vessels on the outbreak of war. Such boats were made up of an uneasy mixture of veterans and younger sailors and very often a recipe for disaster. As was the case with the Live Bait vessels in which another of the Summerstown182, Thomas Lindsay Kirkland perished, many of these hastily requisitioned ships were far from seaworthy. That coupled with an inexperienced crew made them floating timebombs. The Clan McNaughton was a pre-war merchant ship, which in November 1914 was converted into something she wasn’t intended to be. Her crew was mostly made up of reservists and included fifty boys straight out of training school. She was involved in patrol duties in the North Atlantic but had at least twice, before her demise been forced to return to Liverpool with problems. On the morning of 3rd February she was last in radio contact at 6am reporting terrible weather conditions. No more was heard from her. She simply disappeared off the north coast of Ireland and was never to be seen again. No trace of her was ever found nor the bodies of any of the 281 crew on board recovered. The official record simply states that Chief Petty Officer Halliday was ‘killed or died by means other than disease, accident or enemy action’. Speculation surrounds the cause of the ship’s disappearance, a few weeks later some unidentifiable wreckage was found near the spot and there was talk of a mine. However the most popular theory seems to be that the Clan McNaughton was weighed down with too many guns and the combination of that and being manned by a largely inexperienced crew sealed her fate. One sailor on board, Percy Biggs, wrote home before the ship sailed stating that the Clan McNaughton was ‘top heavy with guns and armour… the next time you will hear from me will be from Davy Jones Locker’. 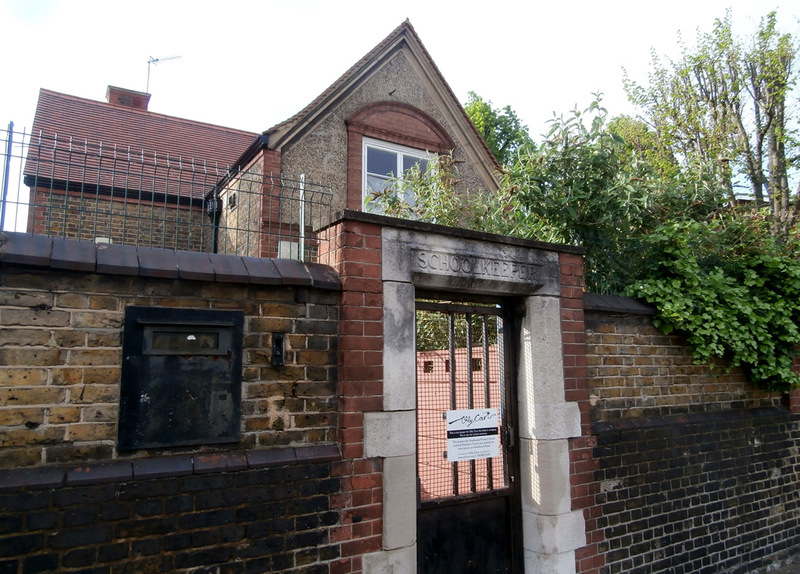 There is an entrance to the school in Smallwood Road that has a stone sign marked ‘Schoolkeeper’ above it. This leads to a small cottage in the grounds which may well have been Francis Halliday’s home. Smallwood School is a majestic red-brick building, almost like a great hulking vessel, it sits at the apex of the Summerstown182 whirl. With its turrets and domes, it is a grand and omnipresent vision whose beauty many people who came on the guided walk last week commented on. The school that so many of these men would have attended casts a stern Victorian eye on all around it, witness to so much change, so much destruction, so much sadness. Put together some time in 1916, this pocket-sized booklet which Christine found amongst her Mother’s possessions is a Smallwood Road School Roll of Honour. Click on it to view the full document. It’s a list of ‘Old Smalls’ serving their Country in His Majesty’s Forces’. The first name in the list of those who had so far lost their lives is Mr F A Halliday. Five of the other twelve are also members of the Summerstown182.